Floorscsapes is a wonderful completely waterproof flooring designed with the ups and downs of daily life in mind! No need to worry about spilled milk any longer. Add to this the lifetime warrenty and see all kinds of visual and practical possibilities in high traffic areas where low-maintenance surfaces are a priority. With the 21st century manufacturing process, Floorscapes, a .30mm and 12 mil wear layer luxury vinyl plank, is sure to be a classic. This floor is sure to spice up any room or comercial area! 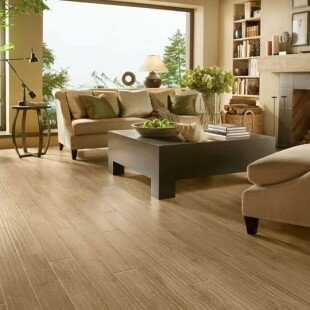 You no longer have to choose between style and practicality when it comes to a vinyl plank floor. Floorscapes is one of our favorites, as it comes with a cork pad backing, already attached! This means easier installation, and gives your floor more comfort and that true wood sound so many ask for. LVP at it's best! The many benefits of incredible attention to detail in replicating the look and texture of exotic wood grain surfaces in luxury vinyl plank flooring are yours in this range of strikingly decorative floors. Each selection is protected by innovative design that makes it a flooring option that you can count on to last for decades. We have chosen 10 of the most popular colors that will give your floor the look and feel of elegance! A Sample Swatch is a 6"x6" or stock size of only one color. Make your choice by selecting a color above, then click "Add Sample to Cart." Price is $6.00 each. Worried about shipping costs? Don't be! We are happy to say that customers are pleasantly surprised at the low shipping costs! We have special rates from the freight carriers, and we pass that savings on to you! And think about it, your flooring has to be shipped, no matter where you purchase, and those shipping costs are simply built in to the high retail pricing! So pick you product and amount, give us a call, and let us get you an exact price for your freight! Don't miss a chance to go over and read our reviews, and recommendations! We pride ourselves in the best customer service and carpet knowledge in the industry! Buying from DaltonCarpet.com gives you over 30 years of knowledgeable service that can help you get the flooring best suited for your needs, while saving you 30-70% off of retail prices. Going direct means you cut out the retail store pricing, which is big savings to you! We have flooring for every need...Residential, commercial, gymnasium floors, churches, solid, patterns, even black light responsive (glow in the dark) carpet! We also surge or bind any carpet to any size rug or stair runner you need. So, select your carpet, and we will make your rug to your custom size. Call us today at 800-338-7811, email us at sales@daltoncarpet.com, or click the chat button to talk with a representative ready to answer questions, or begin your order!